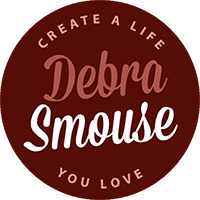 Do you want to create a life you love? What do you need in order to set just the right goals? How do you flesh out your dreams so that you can curate the kinds of experiences you desire? It’s something I’m asked often, which is why I wanted to share how I plan for the year ahead. If there’s one thing I know, it’s this: if you want to love your life, usher your dreams into reality, and curate a life that’s nourishing, you need a plan. I have a deep love for logic. I’ve rarely met a spreadsheet I didn’t like. To the depths of my toes, I know that if you want to achieve something, you need a plan. Yet, I also know that to enjoy the journey, you must make space for serendipity. Plans are necessary if you want to curate a life you love. And so is flexibility. In the Northern Hemisphere, we are fast approaching the Winter Solstice. The transition from fall into winter is subtle at first. We have our first freeze and the rose bushes grow dormant. The autumnal morning chill extends long beyond sunrise. The evening darkness comes early and invites us to light candles and burrow under covers. The logical side of my brain sees the Winter Solstice as a scientific event of nature. Oh, but the believer in magic understands that the Winter Solstice is an opportunity to open the gateway to blessings within your life. That’s why when asked how I plan for the coming year, I look to the Winter Solstice. It reminds me that though there is logic abound? There’s also magic in the air. Harnessing the power of this sweet spot of logical dates with enchanted possibilities? That’s when and how I plan for the year ahead. Despite my preference for things to make always sense, I also have a deep knowing that there is magic afoot in the world. There are miracles waiting to unfold before us, but we often have to suspend our need for logic in order to recognize them. I have come to understand – and believe in – a myriad of matters that aren’t logical or explainable. My heart and soul understands that there are unscientific and un-explainable things in the world that allow us to experience love, find our personal truth and guide us to countless portals to finding our path. You don’t have to trust in magic, but always trust in your gut. It will tell you when the unexplainable is simply your truth. Long before December, I set aside some time with wise advisors. This is a key step for how I plan for the year ahead. One of the best ways to stay on track is to have a personal “Board of Advisors”. Now, some of these folks can be real. And some can be imaginary or literary. There’s all kinds of ways to get wise voices in your life. I have some trusted friends on that list, folks I talk to on the regular. And I also have some women I turn to for more. An annual reading from The Tarot Lady (Theresa Reed). Her tag line is “The cards tell the story, you write the ending”. Theresa Reed (aka The Tarot Lady is whip smart, funny, and kind. She helps me stay true to my own intuition. For the past six or seven years, I’ve gotten quarterly readings from Theresa.I consider her a key part of my Advisory Counsel. And recommend her to clients often. This year, I added her in-depth Entrepreurcast and all I can say is WOW! She only offers a small number of these, so you may want to get on her list. And, if you want to know how the planets may affect your biz life, her Astro-Biz Digest is a subscription you can buy that includes a weekly dive into how the energies of the planets may affect your business life. Another wise woman I look to is Briana Saussy, who focus on The Sacred Arts. From the time I was a little girl I felt the innate magical quality of solstices and equinoxes. In my mind, the mythical Mother Nature turned a special dial to officially change the season. I still feel that magical pull on those days. As I’ve aged, I’ve learned that my childhood view of magic has allowed me to harness the belief that there is magic to be found all around us. To help me with this, I’ve order Briana Saussy’s Book of Hours with every moon stage, equinox, solstice, and more marked on in a downloadable book (along with a thoughtful question for each occurrence. This year, I also scheduled a session with her to suss out one particular challenge I’ve been dealing with. Amy Palko is a Scottish Muse. I got my first Goddess of the Year in 2013 and have been a lover of it ever since. It mixes my love of literature and mythology with a practical way to tap into my own intuition. I believe that each of us knows the answers to what we need. Yet, it’s not always easy to unearth it, right? That’s why we need to ask ourselves good questions. Or get insight from different places. I use her guide in two ways. One, for inspiration for my own Word of the Year as she gives a series of suggested words. Then, I use the Goddess she gives me as a guide for the year ahead. The last couple of years, I’ve written monthly love letters in my journal as a way to stay connected to my own inner wisdom. Before any appointments, here are some tasks I dive into as part of how I plan my year. Looking forward demands looking back. I do a deep dive into the past year. What worked for me? Where there things that no longer worked? What activities felt loving and nourishing? How did I get in my own way? What goals did I accomplish? Which goals fell apart? Looking back on the past year allows me to see where I get stuck. Where I get stuck on the merry-go-round of being busy without being productive. And how I surprised myself with joy or tenacity. Create or Revise my end-of-year offering for subscribers. I’ve been offering a “Word of the Year” book for seven years now. 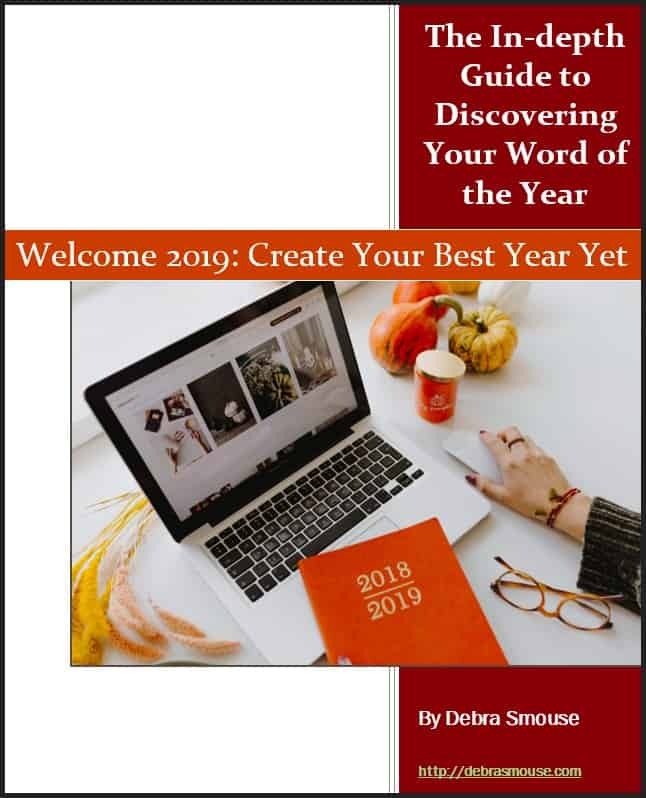 As I create books like my Welcome 2019: Create Your Best Year Yet – The In-depth Guide to Discovering Your Word of the Year, I think about the questions I’ve avoided asking myself as well as the logical questions (that often seem over simplistic). The creation of this tool for others helps me wrap things up and prepare for the year ahead. Playing with my Big Dreams list is a key part of how I plan for the coming year. If you’ve been following The Advent Series, you see that I begin with the tent of hope and ask myself: what are your hopes and dreams for the year ahead? Is my creative spirit calling to me to create something new? Are there experiences I”m long for? What do I no longer want to do? Do I need more of anything? What might I need less of in the coming year? Which pieces of my current business world do I still enjoy? I take a hard look at my energy levels and make an honest evaluation of how many private clients I can realistically manage. Do I still enjoy coaching the folks I am working with? Are they making progress on their goals and desires? Do I want to coach more clients in the coming year? Or fewer? What about my courses? I look at my existing courses. I ponder what new courses or products I desire to create.I play with the mix of coaching, writing, and daily life. How does the calendar inform my tentative plans? What travel is already in our schedule? When do holidays fall? What about special occasions? If I were a client, what when would I want to clean my closet and ponder my desires? I create the schedule for my 30 Days to Clarity family of courses. I keep a running list of holidays that are important to me for planning, such as the beginning of Lent and Advent. When new moons fall. Am I making the best use of my time, talents, and energy? Sometimes, our tried and true routines are key. Yet, sometimes, they no longer work. Or, we find we’ve fallen away from any and all routines. More critical: where am I getting in my own way? Where am I self-sabotaging? It’s hard to look in he mirror at times. Yet, it’s critical for me to look at my own habits. And how those habits either help me succeed. Or if those habits are taking my progress or productivity. After (most) of my calls and inputs, here’s how I plan for the year ahead. This allows me to see if I should consider another year with the word (my 2018 word was “Sacred Spaciousness). How was I true to the word? How did it serve to assist me and hold me? Was it active enough or passive enough? It’s important to follow through by practicing what I preach. Celebrating the triumphs of the year – on paper – is super important to the process of living consciously. It forces you to look for the successes while you’re acknowledging where you fell short. It’s also a good way to bring gratitude into the process. I narrow down my words for the year, but usually don’t choose them yet. Analyze the roles I fulfill and identify the priorities. I have this belief: the area of your life that you chose to make a priority? Being devoted to that allows the other areas of your life to fall into place. This calls for looking at my roles. And not just the roles I fulfill, but what the goals are for each role. And if that area of my life is “healthy” or in the red. Sometimes, we neglect specific roles or areas of our lives for all the right reasons. And if they’re the right reasons, life, overall, still feels nourishing and balanced. Other years, that isn’t the case and life feels sloppy. That’s why it’s critical to look at the roles, analyze what’s a priority in the coming months, and look to see where life may need better balance. They say all work and no play will make you a dull person. I want to work hard, yet also ensure all the areas of my life are getting enough attention to keep life interesting. And, this ensures I’m less likely to feel burned out, too. Unplugging for at least one full day is a nourishing act. I spend so much of my time on my computer that I need to unplug. Planning a day with zero work priorities and no (computer) screen time allows my subconscious to work in the background. Typically, I cook a complex recipe or do some baking. Decluttering of my closet, office, or kitchen is a good activity. Sometimes, I catch up on favorite televisions (or let Hallmark Christmas Movies play in the background. And time and again, my subconscious does keep working in the background. New ideas surface. Big ah-ha’s arise. Or something I’m really craving works its way to the surface. My most sacred ritual is choosing a word (or three) of the year. I review my short list of words I settled upon while I went through my book. I’ve been choosing a Word of the Year since 2003. Then I celebrate the new word. I write about it in my journal. And envision the ways it will support me in the year ahead. Sometimes, I put recurring tasks in Outlook to remind me to check-in with my word or words. All my spreadsheets and calendar get some love and attention. Spreadsheets are how I keep things organized. I choose dates for all my existing courses. Define goals for any new courses I plan to create. Note important or key dates for the year ahead. I use WordPress to manage this website – including a calendar plugin. So, adding key dates as reminders helps me visualize the year. Then, I look to my blog spreadsheet. I post one to three blogs a week, so begin laying out specific topics to cover during particular periods. And brainstorm topics I want to dig into in the coming year. I may brainstorm some blog titles or simply note a series of topics to research and write about. My calendars get some final love. All start dates and appointments get added to Outlook as well as a Year at a Glance calendar. I feel accomplished. So, my dear, that’s the answer to how I plan for the year ahead. While I know some of these steps appear too detailed. Or may not apply to you, your life, or your business. I do know that the “one elegant idea” theory means that maybe a single task from how I plan for my year will invite you to try it for yourself. Take my end-of-the-year processes you like and throw out the rest. 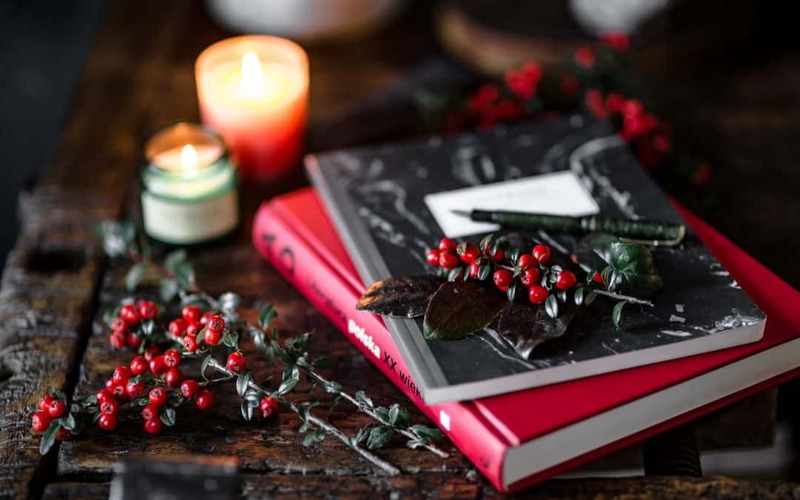 I know (both logically and soul-deep knowing) that a little forethought can serve you to bring in the logical and the mystical to help you say goodbye to 2018 and prepare for a phenomenal 2019. You deserve to life a daily life that feels loving and nourishing. Sometimes, you need just the right inspiration to spur you forward. Just know that you can curate the right pieces to make your life support your desires and dreams. Be willing to bring your mind together with the help of a deep faith in what your soul shows you. And never be afraid of a little planning, magic in the air, and a desire to experience something more. After seeing how I plan for the year, are you ready to dive in? Choose a Word of the Year! Life is busy. Yet I also know that if you are here, you desire to have a nourishing daily life. 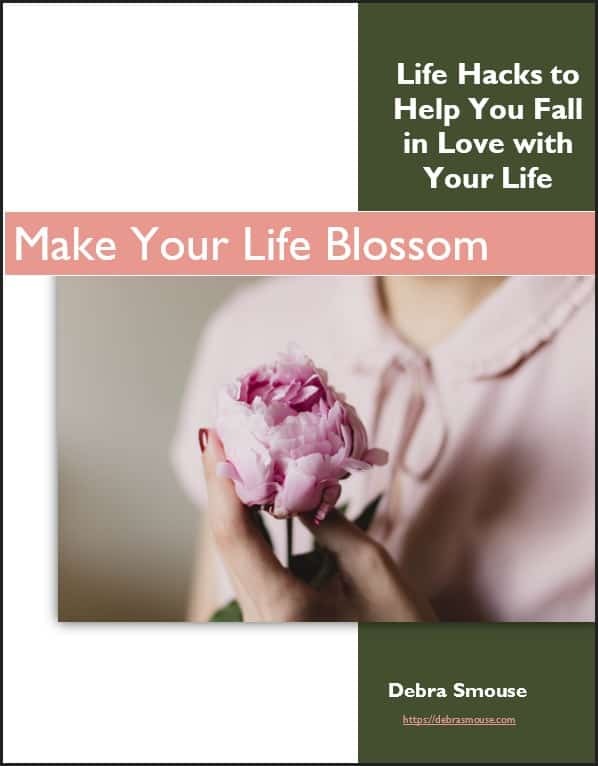 This eBook / workbook is designed to help you with that.